The first major bridge across the Yangtze River was the Wuhan Yangtze River Bridge built in 1957. The number of bridges crossing the Yangtze River is now in the hundreds. The Yangtze River tributaries include the Yalong, Min, Tuo, Jialing, Han, Wu, Yuan, Zi, Xiang, Gan, and Huangpu. Ocean-vessels are able to travel 1000 miles up the Yangtze River and smaller boats can travel much further. 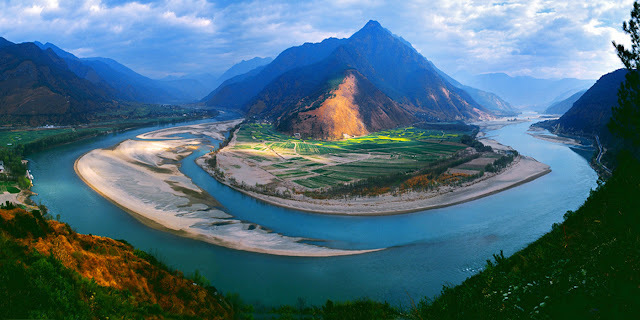 The Yangtze River's watershed (area of land drained by the river) is more than 695,000 square miles. The Yangtze River's source is Geladaindong Peak in the Tanggula Mountains in the Quinhai province in the People's Republic of China. This area is part of the Qinghai-Tibet Plateau. When the Yangtze River first appeared on maps made by the English it was named Quian, and Quiansui - names given by Marco Polo. The Yangtze River is home to the world's oldest existing dam-free irrigation system. It is called the Dujiangyan Irrigation Project and is located west of Chengdu City on Minjiang. Local names for the Yangtze River vary among different regions. It is called 'Sichuan River', 'Jing Jiang', 'Wan Jiang', 'Yangzi Jiang', 'Jinsha River', 'Tongtian River', 'and 'Dangqu River'. It has also been called Blue River. The Yangtze River is called 'Chang Jiang' in Chinese, which means 'long river'. The lower part of the river had once only been referred to as Chang Jiang but eventually it became the name for the entire river.